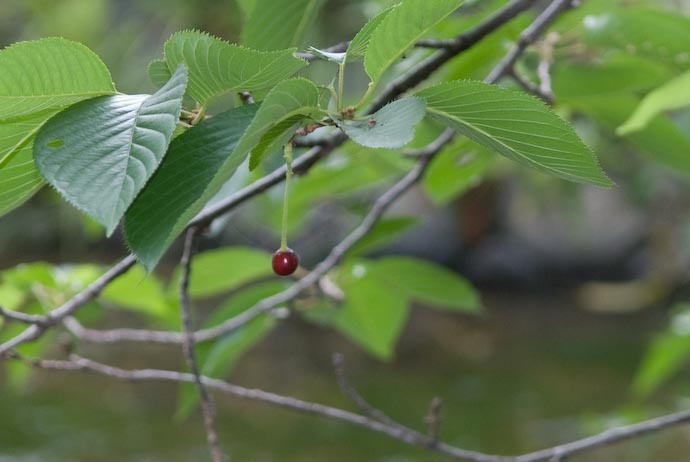 For some reason I thought that the cherry trees in Japan generally bore no fruit, so it was with some surprise that a cherry almost hit me in the head while I was standing under a tree today. Sure enough, there were a few very small cherries (the size of large peas) here and there on the branches. It was windy and hard to get a picture of anything, but I did taste one and it was bitter-sweet, which reminded me much of what the normal wild cherries I had as a kid. I was trying to replicate it during the day, using a Kenko ND400 filter, which cuts the light by a factor of 400 (about 8 2/3rd stops). 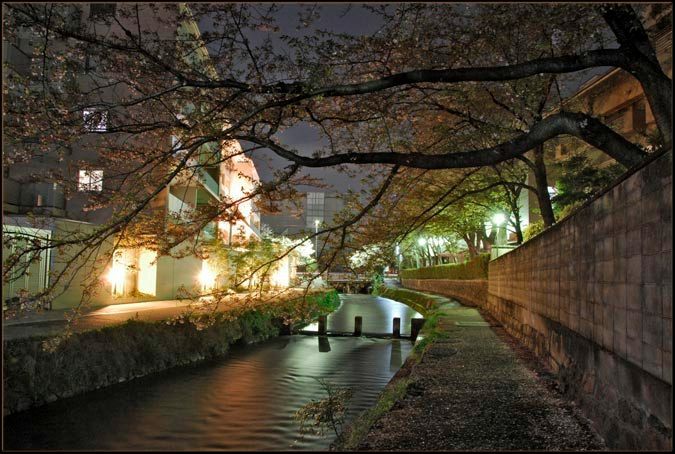 This lets you have long exposures, which smooths out the river, hides random people and cars that pass by, and perhaps (I wondered) lended an interesting feel to the results. I was wrong. 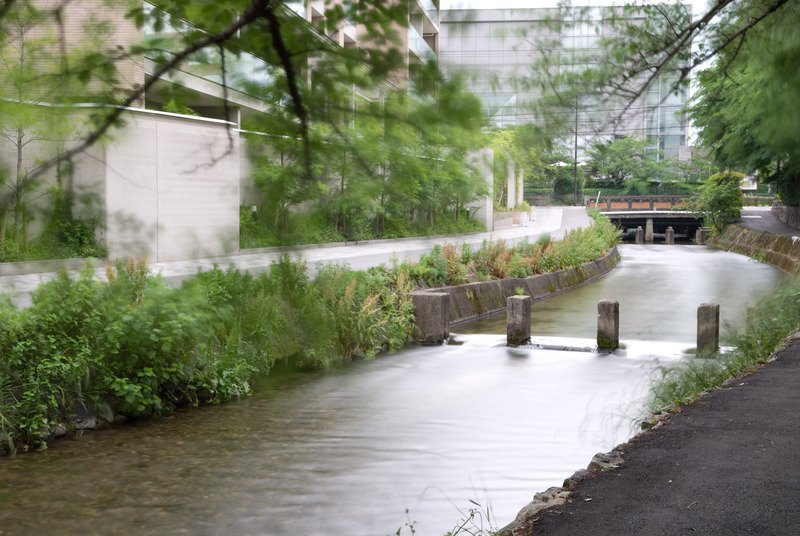 The river was indeed smoothed in the 41-second exposure, and the few people and many cars that went by are all but invisible, but ugh, it's a totally bland results. 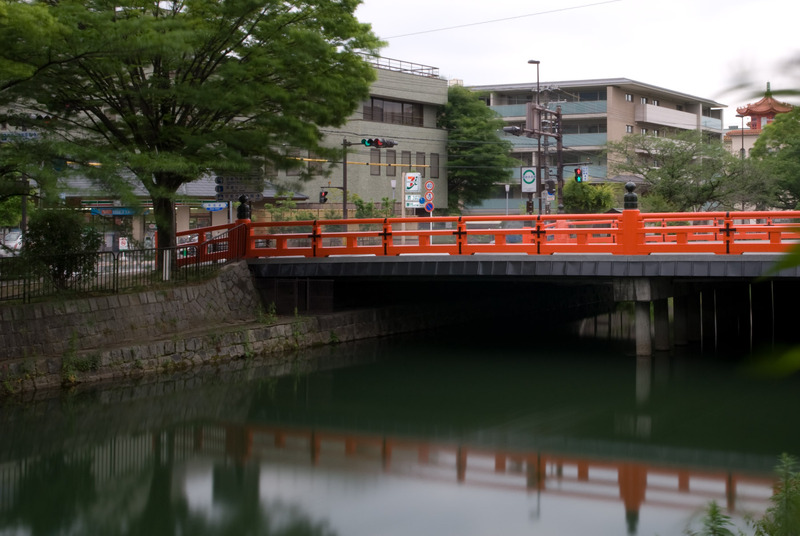 I'd also tried one aimed at the nearby bridge, which is also bland, although the traffic light showing both red and green at the same time is a bit freaky. Your post about the traffic light brought me back to a phenomen which I would like to report. The signals are LED type and one aspect was shown at the time of the picture. I took my digital camera (PANASONIC LUMIX FZ-1) and while looking to the display and waiting for the focussing of the cam, the strange thing happened. At the beginning of the shot, the red aspect of the signal was clearly to see in the display, but while focussing it slowly disappears and at the moment of the shot itself it was completely gone! The picture shows a dark signal! Which was of course not dark at all in real! Finally I focussed the cam manually to the stand of the signal, moved the cam to the signal itself and took the picture very quick. It worked out, the picture shows a red aspect signal. Thomas, I’d guess it’s because LEDs flash. They flash too quickly to notice normally, but if you swing your gaze very quickly past them, you should be able to see the flashing. When you took the photo, it was probably during a moment between flashes. As for it slowly disappearing, you were looking at the preview display on the camera, right? I’m guessing that the update frequency of the camera was close to (but not exactly) an even multiple of the update frequency of the LEDs, and that it would slowly come back if you looked longer.